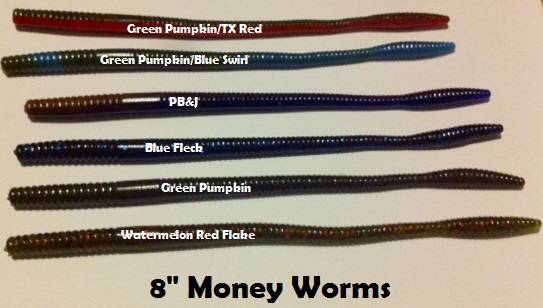 These 8 inch finesse worms are great for catching big bass. Our 8 inch soft plastic finesse worms are durable, and will outlast other competitors. The Money Worms got their name after FLW Pro Claude Williams used them for a weekend and knew right then they would bring in a lot of tournament cash. He was absolutely right. Available in bulk 250ct packages only.